A neck dissection is an operation to remove lymph nodes from the neck on one or both sides. Lymph nodes are glands that are present throughout your body. You may have felt swollen lymph nodes in your neck when you have had an infection such as a simple cold. Their job is to filter the liquid which naturally leaks out of blood vessels. This liquid (the lymph) travels to the nodes which contain lots of white blood cells designed to trap and fight germs which can cause infection. As well as trapping germs, the lymph nodes can also trap cancer cells. Have I got cancer in my lymph nodes? It is often not possible to tell this until after your operation when the glands removed from the neck are carefully looked at under a microscope. I will have already felt your neck to see if there are any lumps and you will have had a special scan (CT or MRI) to look more closely at the glands. Glands can feel big if there is infection in the area, so if you can feel a lump in your neck it does not necessary mean that the cancer has spread. If there are only small amount of cancer cells present in the glands then the neck can feel normal and look normal on scan. This is often why we do not know if the cancer has spread to the neck until the glands have been looked at under a microscope. Will I be able to fight infections once my lymph nodes have been removed? Yes. There are thousands of lymph nodes throughout your body which will still be there to fight infection. Accessory nerve – this is a nerve which runs from the top to the bottom of the neck and helps you to move your shoulder. The nerve has lots of lymph glands lying very close to it and so it is often bruised during a neck dissection. If the nerve is bruised it can stop working for several months. If this happens you may experience pain and some difficulty in moving your shoulders which makes getting dressed less easy.Rarely the lymph nodes cannot be completely removed without cutting this nerve.Should this be the case then these shoulder problems will be permanent. Facial nerve – the branch of the facial nerve which makes your lower lip move can be bruised when the lymph nodes close to it are removed. If this happens then the lower lip doesn’t move properly and you may end up with a weakness which results in a crooked smile. The majority of these get better on their own but can take several months to improve fully. When will my neck dissection be carried out? A neck dissection is usually carried out at the same time as an operation to remove a cancer from around the mouth or face. It will therefore take place under the same general anaesthetic. A large incision is made to gain access to the lymph nodes in the neck. The cut usually starts just underneath the chin and extends downwards towards the collar bone before arcing upwards to end behind the ear. 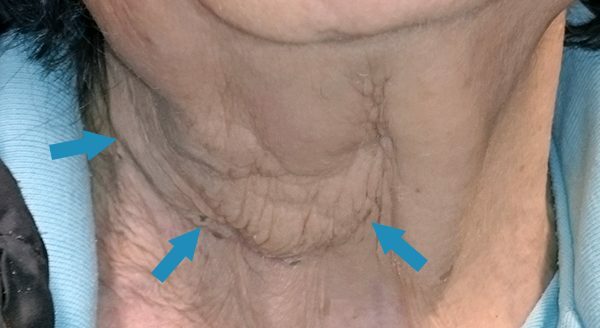 This flap of skin is lifted off the tissues of the neck to expose the lymph nodes. Once the lymph nodes have been removed the flap of skin is replaced with stitches or clips. At the end of the operation a number of tubes are placed through the skin into the wound to drain any blood which may collect. These usually stay in place for a couple of days before being removed. Some discomfort is to be expected and is usually worse for the first few days although it may take a couple of weeks to completely disappear. It is necessary to make sure that the incisions heal without any infection and so you will be given antibiotics through a vein in your arm whilst you are in hospital. You will also be given regular painkillers. The skin stitches or clips will be removed around a week following surgery. The skin of your neck will feel numb for several months after surgery as a result of bruising to the nerves. Will I need to have further treatment after my neck dissection? This depends on what is found when the lymph nodes are looked at under a microscope. It takes several days to look at the lymph nodes properly and so I will not know until then whether additional treatment is necessary to help cure you of your cancer. Any additional treatment usually involves specialised X-ray treatment in the form of radiotherapy.